Beset by awkward interpersonal skills, an obsession with classic literature and the somewhat archaic speaking style of a Jane Austen character, Ishmael Archer seems destined for the lonely life of a literature professor at the academic backwater of Longfellow College. While he yearns for female companionship, he has been left in emotional and financial disarray after his recent divorce. Struggling to pay his rent and trading in his car for a rickety bicycle, Ishmael Archer is obliged to undertake his most dreaded task: teach a summer creative writing class. Convinced that he will be saddled with a group of student malcontents who care not a whit for Tolstoy or Dickens, Ishmael is delighted to encounter the luminescent Abigail Bird, whose passion for literature equals his own. Their burgeoning romance is cut abruptly short when Abigail suffers a traumatic head wound and falls into a coma. Distraught, Ishmael reads the unconscious Abigail passages from her most cherished novels. When she finally awakes, however, Abigail is inexplicably changed and Ishmael must find a way to connect with the Abigail Bird with whom he had fallen in love. 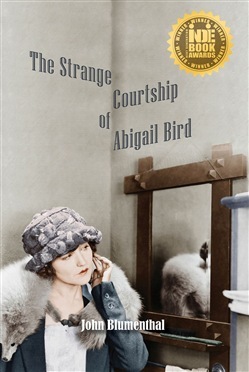 Peppered with an enthralling cast of characters—a college dean obsessed with orchids, a Greek landlord who possesses a tendency to break into dance, and a self-important writer who vies with Archer for Abigail's affections—The Strange Courtship of Abigail Bird is a heart-warming tale of love, loss, and rediscovery. Acquista The Strange Courtship of Abigail Bird in Epub: dopo aver letto l’ebook The Strange Courtship of Abigail Bird di John Blumenthal ti invitiamo a lasciarci una Recensione qui sotto: sarà utile agli utenti che non abbiano ancora letto questo libro e che vogliano avere delle opinioni altrui. L’opinione su di un libro è molto soggettiva e per questo leggere eventuali recensioni negative non ci dovrà frenare dall’acquisto, anzi dovrà spingerci ad acquistare il libro in fretta per poter dire la nostra ed eventualmente smentire quanto commentato da altri, contribuendo ad arricchire più possibile i commenti e dare sempre più spunti di confronto al pubblico online.